Have a couple, only "pure game" themed is Asteroids (arcade vector graphics), but maybe half a dozen retro computing themed ones. 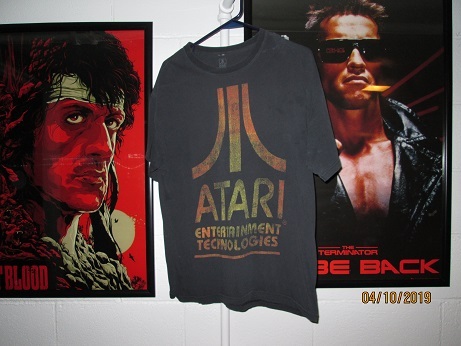 I have an Atari, Nintendo and TI-99/4A shirts. And soon when my wife makes it a Myarc Geneve 9640 shirt. Nope. 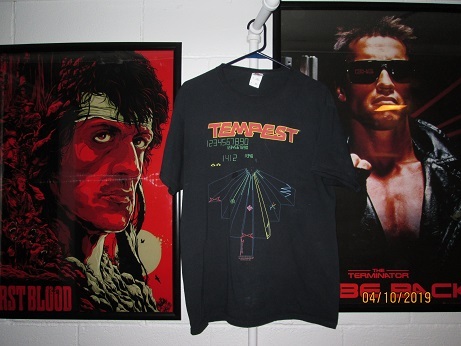 I stopped wearing T-shirts with printing on them in my 30's. 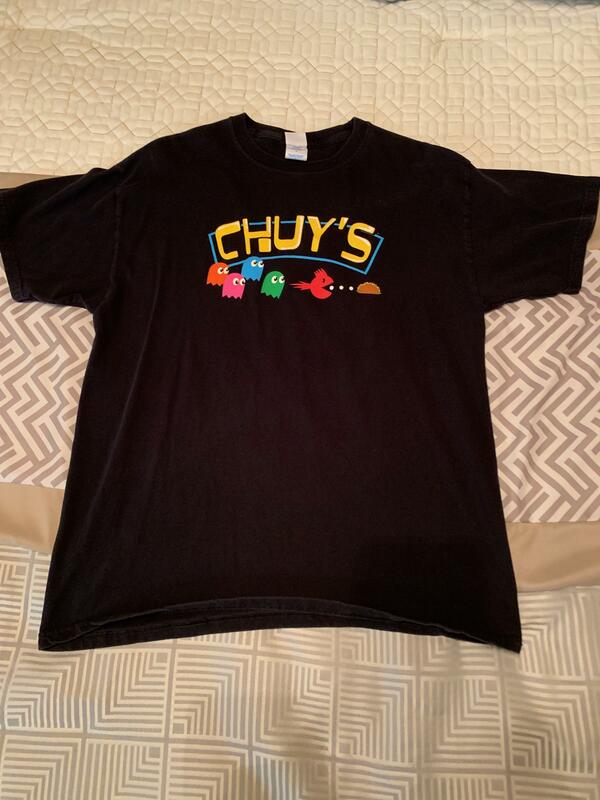 The designs would wear out before the shirts did, and made them look clunky. 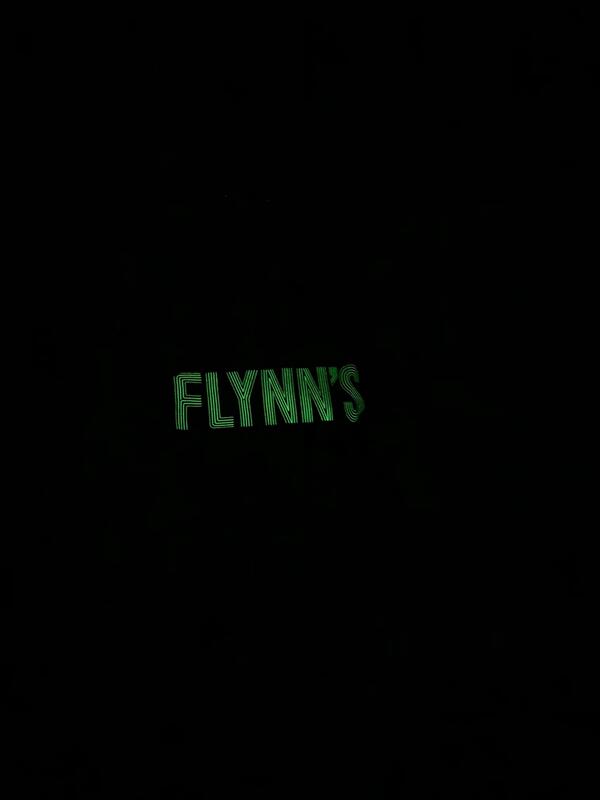 Plus I don't really feel the need to advertise things for other people. 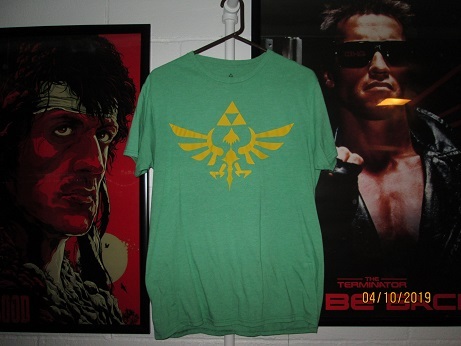 I wear gaming related clothing almost all the time. 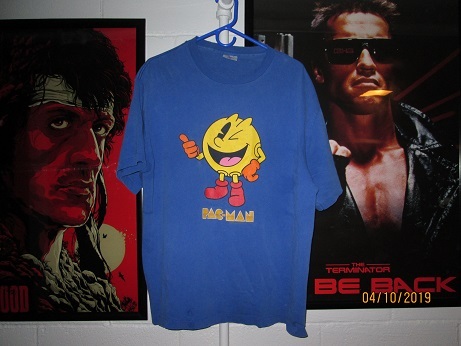 In the 90's, I made my own t-shirts from printer-transfers which you sealed. They did not hold up well, so I was constantly re-making them. Later, as custom printed shirts became more common, I started having custom shirts made which are worn once of twice a month and last for many years with that rate of laundering. 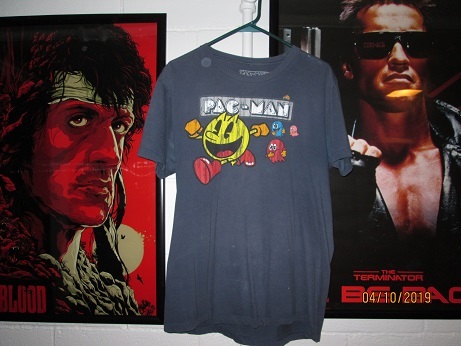 I own about 20 different shirts with game box art, screen shots, and logos from arcade classics like Galaga, Pac Man, Atari, Nintendo etc. 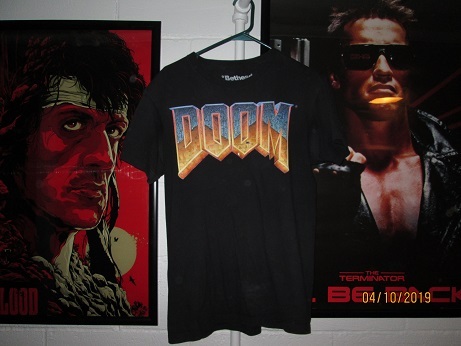 In addition to custom shirts, I also have many official shirts from video games like Duke Nukem 3D (several types), Duke Nukem Manhattan Project, Duke Nukem Forever, Daikatana, Super Noahs Ark 3D, Dangerous Dave, DooM 1 2 3 and Final DooM, Quake 1, 2, & 4, and modern stuff up to Red Dead Redemption II and several others I can't think of. 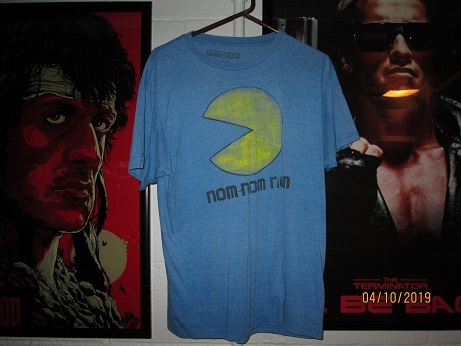 In addition to shirts, I have/wear four belt buckles... Duke Nukems nuke symbol, Packman screenshot, Nintendo chrome/enamel controller, and color enameled Atari logo. I did get the Nintendo controller pattern Vans high-tops. I see a lot of socially based comments about appropriateness... but I don't concern myself too much with preferences of society and its trends, or concerns with advertising for others etc... I see this as fitting for myself as this is a fair representation of one of my greater interests. Not just relative to clothing, I do WAY more of what I am comfortable with vs what is appropriate for persons I don't know to feel comfortable with. I have almost no level of trend compliance I suppose. I am also non-social, so this isn't an issue. I had to select Yep, I sure do because there wasn't a "oh HELL yeah, I wear video game related clothing!" option. 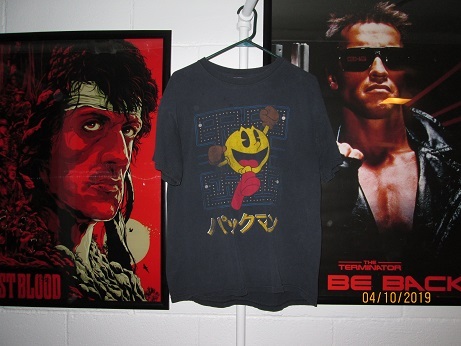 Oh, and I have a Duke Nukem door mat and pillow case both in use... lets not forget those. 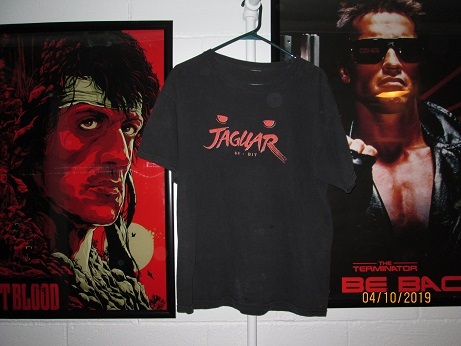 Need more Jaguar and Bubsy related clothing! 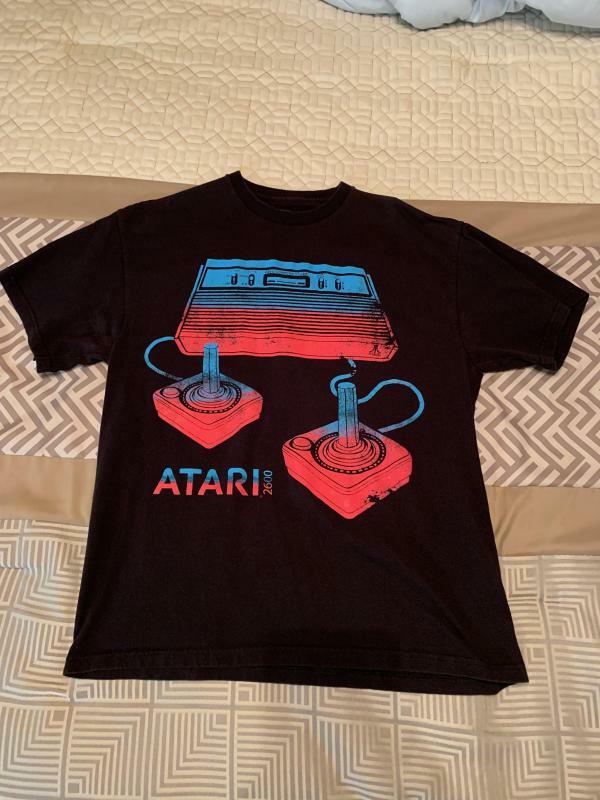 Just a couple Atari logo tees. That's it. Edited by SmellyJelly, Sun Mar 17, 2019 3:58 PM. 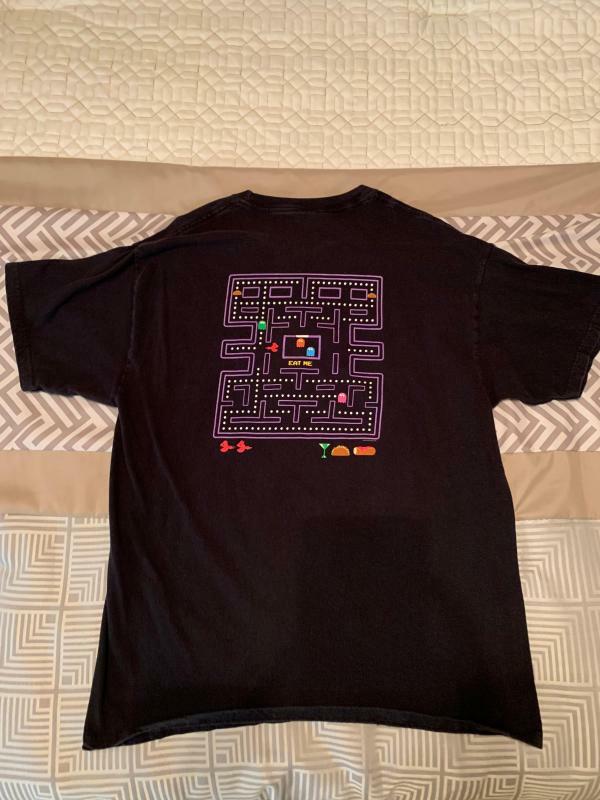 I have shirts for Mario, several Zelda (including one for the symphony), some Sonic, but several Atari including Pacman, Tempest and Adventure. 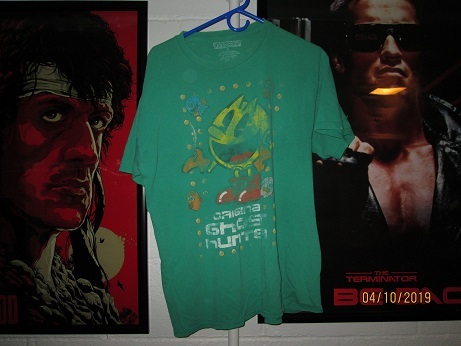 Pretty much most of my shirts are video game related. I also have a Mario logo baseball cap, and Cappy from Super Mario Odyssey. Edited by matthew954, Wed Mar 20, 2019 9:16 PM. 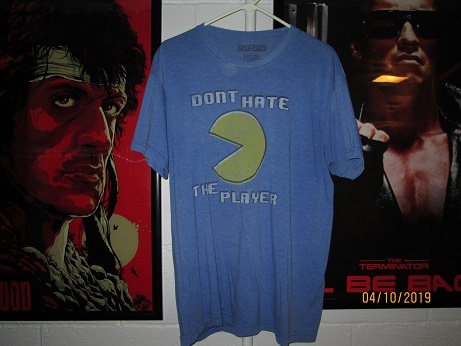 I have a Super Mario World t-shirt as well as Legend of Zelda, and a Pac-Man shirt that says Gamer Things over in in Stranger Things lettering. I work in a very casual environment, so I can wear them there if I want to. These are some of mine. I also have a few others, like one that says "I went outside once. The graphics weren't that great." Love the Mario Kart one. 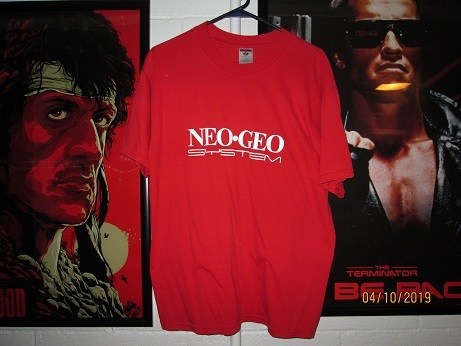 I had a really cool Gunblade NY t-shirt that I sold on ebay years and years ago, now strongly regret. 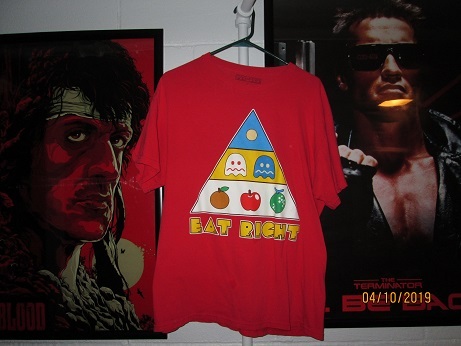 Also had a really great Saturn NiGHts shirt that I outgrew and sold. 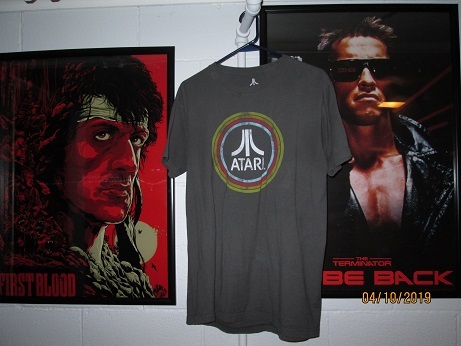 Still have a some treasured VG shirts - Space Channel 5, Halo Wars, the original StarCraft, Castle Crashers, and recently grabbed one of the Target Atari shirts because I liked the design (even though I see them on people online and in person too often for my taste, hate being common ). 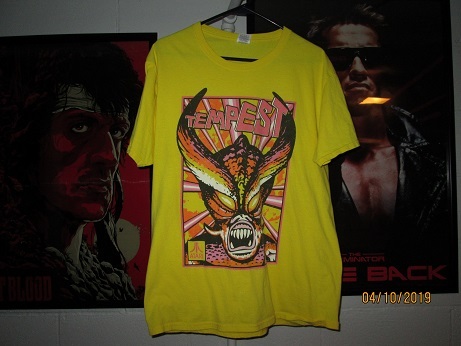 Got some really cool Mortal Kombat, Moon Patrol, and Joust shirts at the PRGC that I got to go to a few years back, wish I would have gotten more from that vendor. I get compliments on both the Joust and MK shirt every time I wear them. 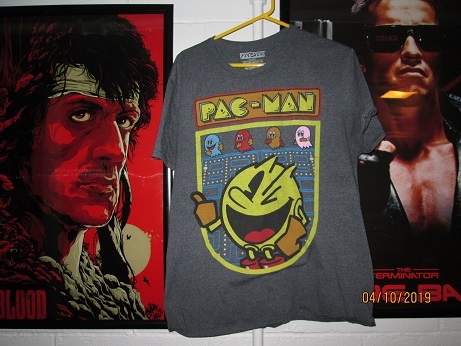 Not just men either, a female clerk at Pier 1 was all "sweet Mortal Kombat shirt - I still love that game!". It's just a black shirt with a red MK Dragon logo, simple and pure. 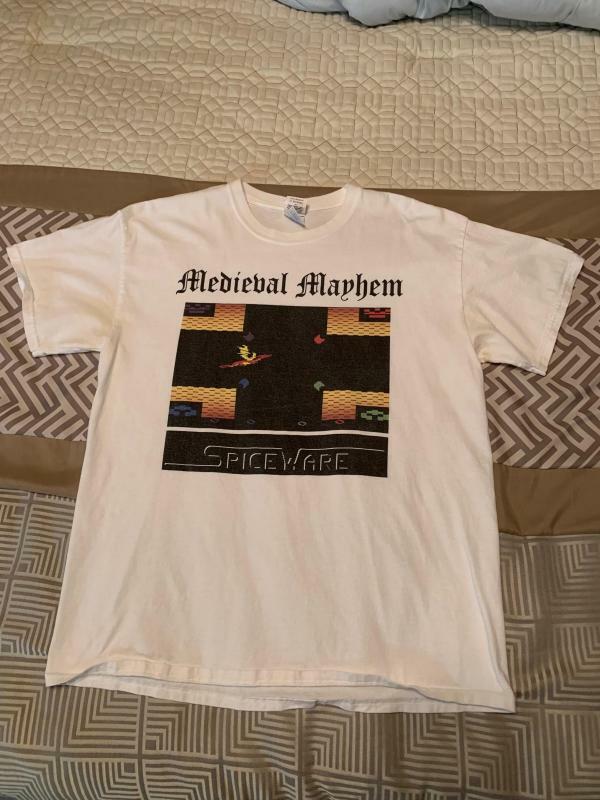 I have a few I wear at retrogaming events. Seldom at other times. The Medieval Mayhem one was a gift from friends. If I'd had it made I'd have done the SpiceWare logo a bit differently. 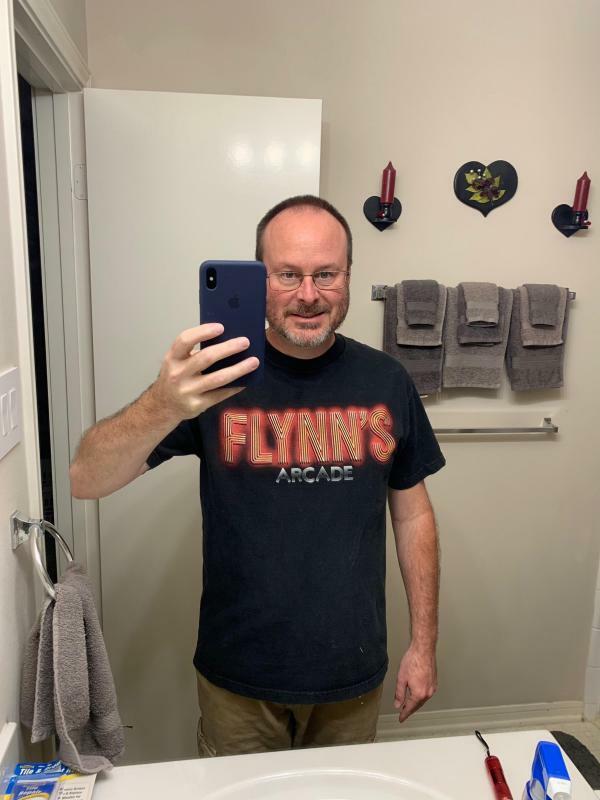 Love 'em all, but the Flynn's Arcade shirt #1 in my book. You may be the last person with one, at least one that still looks new. You may be the last person with one, at least one that still looks new. Today: Wearing a dark gray t shirt with a classic NES controller on it. When I was a wee lad I had Mario 3 pajamas Does that count? 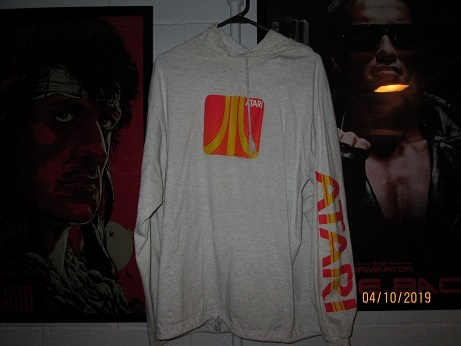 I even have 2 of the Atari E.T. Excavation t-shirts. I didn't get to go but, as soon as it was done, I watched on ebay found someone with 2 of them and I paid $10 for both....One to wear, one to keep sealed in a bag.. Seeing that they sold on ebay for over $200, it appears I made a good investment..
Edited by TheCoolDave, Thu Apr 11, 2019 7:57 PM. I don't see any shirt there.